The Timi and Leslie Annette Bag is perfect for that expectant or new mom. Even though you’ll have baby in tow, you’ll still look super stylish! No need for a diaper bag? This would be the perfect gift! Absolutely gorgeous! Enter to win below! 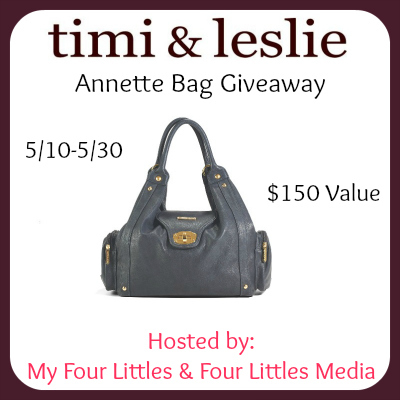 Check out the Timi and Leslie Review on My Four Littles. 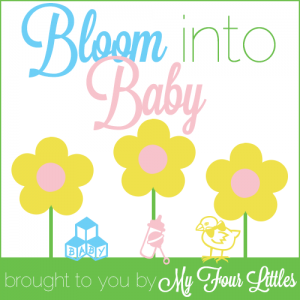 « How To Get Your Kids Making The Most Of Spring! I would probably give it to the next person in my life who has a baby shower. I think it’s a nice bag. I may keep it. I’d love to keep it. Thanks so much. If I win I’d give this to my friend who is due in October. I would keep it as I am raising my granddaughter. KEEP IT!! IT’S SO CUTE! I’d give this to my daughter who is having a baby! I would give it away to my niece for her new baby. I would keep this bag. I hae twins on the way and this would be so handy to have! I would be keeping it. Thanks. I’d give it to my wife. She’ll love the bag. Oh I would keep it for sure. I would keep it. I like it a lot. I wouldn’t let anyone have it but me..So please let me win because I never win anything. I would have to keep it, because I am unemployed and cannot afford a new one. Keep it! Its much better than my current diaper bag!!! probably give it away—know several expectant moms.